Whenever a male celebrity opens up about the imbalance of gender in Hollywood, there’s usually a moment of “Oh god please don’t say something that’s going to make me never want to watch another one of your films,” followed by a great sigh of relief when said male celebrity is totally spot-on about the issue. There are many wonderful male feminist celebrities out there, who, with their work and voice, are helping to improve the status of women in the industry. 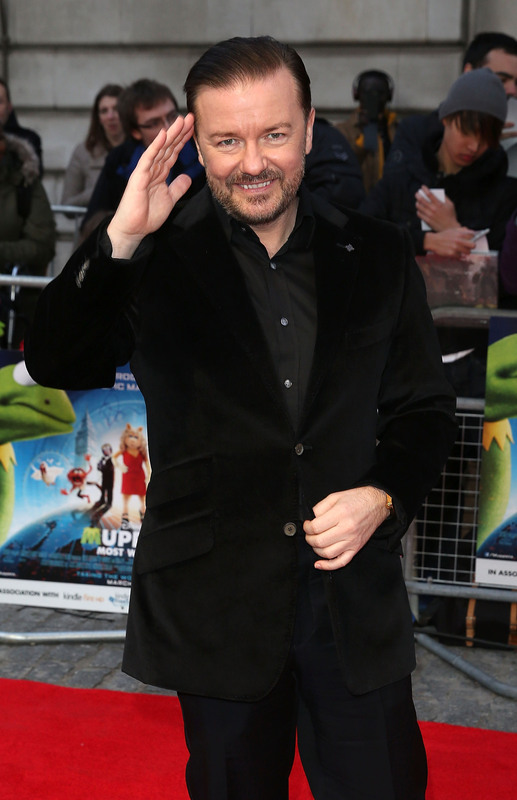 Ricky Gervais is now one of those fellas. In an interview with Radio Times, he said that he loves writing complex female characters, "because usually they’re props, particularly in comedy." And oh, is he ever painfully right. Even in Hollywood, they're usually air heads or if they’re ambitious they're straight away cold and need to be taught a lesson... They need to show that getting a man is more important than getting a career. Or they’re just props for men to do funny things. It’s encouraging to know that someone as powerful in the world of comedy as Ricky Gervais is doing something about it. But as much as I applaud Gervais’ recognition of the boys’ club that is Hollywood — and especially that is comedy — his words still don't do enough. We still need more women running the show. We still need more women writing and starring in comedies. Mr. Gervais, if you really want to be a part of a shift in power dynamics, please don’t just write better women into your shows, hire more women to write these shows. Produce a show whose main character or characters are women. Hire women to direct. When women are behind projects about women, the results are phenomenal. Broad City, Parks and Recreation, Girls, The Mindy Project, and New Girl are just a few examples of the incredible work that is happening about and by women in television. But it’s not enough. We can’t depend on Amy Poehler, Tina Fey, or Mindy Kaling to do it all. They’ve done enough (sike! no such thing! ), and then some. Sure, it’s a bit problematic that Girls wouldn’t have happened were it not for Judd Apatow. Or that I’m asking Gervais to create more opportunities for women... because those very scenarios point out just how difficult it is for women in the industry to make it on their own. It's always a very touchy matter of who is speaking for whom. Gervais can point out the gender imbalance, but he sure as heck can't say what it's like to be a woman in comedy. Apatow couldn't tell you what it's like to be a twentysomething female Brooklynite. That's why we have Lena Dunham. It's both helpful and harmful in the sense that more stories about women are being created, but also that they might not have ever seen the light of day were it not for a man backing or starring in the project. That said, we don’t exist in a vacuum. Men and women should be collaborating on creative projects. The more men we have in our corner, the better off we’ll all be. But we can't just address the problem — we have to do something about it. Gervais continued, “People think that men rule the world but they don’t, really... That was never my experience growing up and certainly not [on Derek]. Men, when they’re together, revert to the playground.” Hear, hear. Now let’s all play fair, eh?